Our hands are exposed, perhaps more so than any other part of the body – so they’re often the first to suffer the effects of ageing. Here, the skin is thinner than on the face, over time becoming noticeably dehydrated and pigmented. 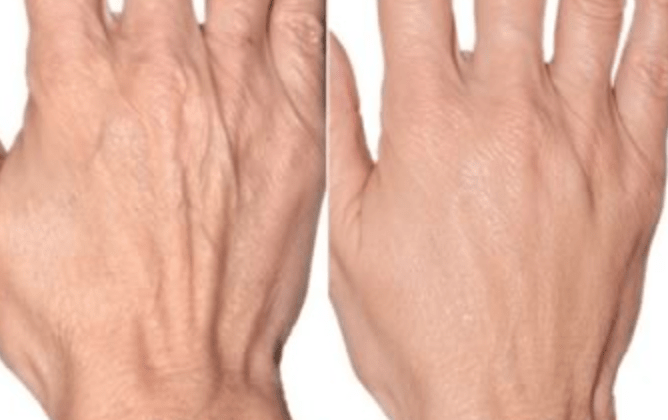 What’s more, as the skin gradually loses volume, the veins, tendons and bones in the hands become increasingly visible. At 23MD we combine the best treatments and modalities in our hand-rejuvenating treatments. This helps to hydrate the skin, tackle pigmentation and encourage cell turnover for long-lasting rejuvenation. Skin Boosters are made of Hyaluronic Acid, a substance which occurs naturally in the body, which is non-crosslinked – so it spreads, rather than volumising. Once injected beneath the surface of the skin, Skin Boosters help to provide the tissue with deep hydration while also promoting collagen production. Mesotherapy is a bespoke blend of natural ingredients such as Hyaluronic Acid, vitamins and minerals, designed to address a patient’s specific skincare concerns. It is delivered to the skin’s surface via a series of microinjections, providing nutrition and hydration while boosting cell turnover. Chemical peels are used in combination with other treatments to help boost cell turnover, reduce pigmentation and improve skin laxity. With little to no downtime, they are a quick and effective way to restore a healthy-looking skin. Laser hand rejuvenation works by removing the topmost layer of skin, eradicating damaged skin cells. The laser is attracted to the pigmentation in the skin, which absorbs the heat energy from the laser, and thus destroys the pigmented cells. A new layer of skin is subsequently regenerated, free from fine lines, pigmentation and other age-related blemishes. In doing so, dark spots are effectively removed. BTL Exilis combines radio-frequency and ultrasound, which helps to promote collagen formation. Applied to the backs of the hands, it helps to plump crêpey skin and restore natural volume. Hyaluronic Acid-based dermal fillers can help to replace volume lost from the hands over time. These are injected beneath the skin, into the collagen layer, in order to mimic the natural tissues of the body and restore structure. One or more dermal fillers will be prescribed, based upon the patient’s individual need.